A Columbia team has advanced to the world finals of the International Collegiate Programming Contest (ICPC). They will go to Porto, Portugal to compete against teams from universities around the world. 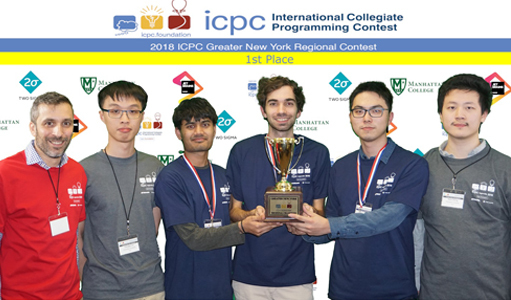 Composed of computer science students – Victor Lecomte, Bicheng Gao, and Aditya Shah – the team finished first place at the greater New York regional championship held last November at Manhattan College. A unique aspect of this programming competition is that teams have five hours to complete ten computational problems with only one computer to use between them. Lecomte shared that their game plan was to get the easiest problems out of the way quickly then figure out which harder problems to tackle. By the end of five hours they had finished eight problems. Coaches Chengyu Lin and Peilin Zhong helped Team Kington prepare for the regionals by holding weekend training sessions for two months. Through that the team got to know each other and figure out how to best work together. In preparation of the world finals they are headed to Beijing, China for a week-long intensive training camp at the end of February. On-campus training sessions are open to everyone that want to sharpen their skills, shared Chengyu Lin, one of the coaches and a third year PhD student. The sessions are also a good way to prepare for potential interview questions as the practice problems are often the same as what Google recruiters ask. Lecomte has been contacted by recruiters because of his involvement in the competition. “This is challenging work but if you love programming, if you love algorithms, this is definitely a way to improve your coding skills,” said Lin.